← One Falcon Heavy rocket launched, three Falcon cores landed. I’m all for big TVs, the bigger the screen, the better. In fact, given the space and inclination, I’d go all-in on a projector instead of a TV. Sony has a new UHD TV that is the biggest we’ve ever seen. 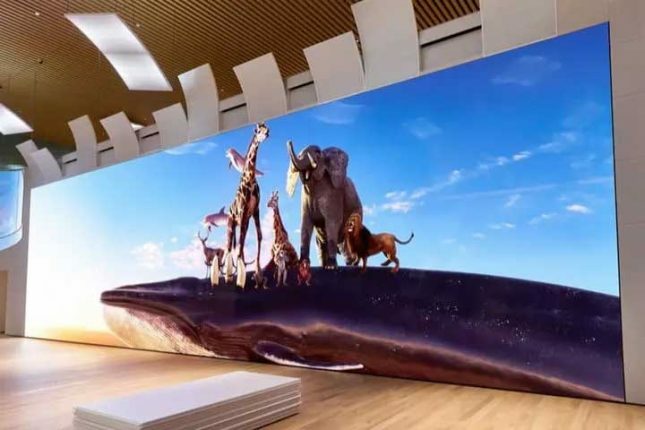 The giant MicroLED display is 17-feet high and 63-feet long. That is about the size of a bus. I want to play Red Dead Redemption 2 on it. The tech inside the TV is called Crystal LED, and it has 16k screen resolution. That’s a lot. That resolution gives 16 times the pixels you will find in a typical 4K UHD display. The giant screen isn’t a single massive screen; rather it is a bunch of bezel-free panels put together. From a distance in photos, you can’t tell there are seams, but it’s not clear if you can tell up close. Screens like this are expected to replace the projector and silver screen at movie theaters one day reports Maxim.